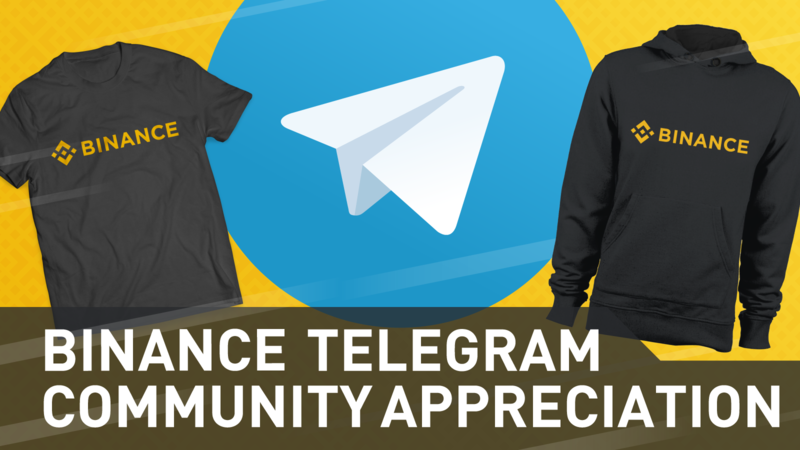 We are introducing the Binance Telegram Community Appreciation promo, as our way of thanking our Binance community on Telegram. With this promo, you can get a chance to win exclusive Binance merchandise such as t-shirts and hoodies! 2. Be part of the Binance English Telegram community by January 29, 2018, if you’re not in the group already. Be an active participant in the conversation for 3 days running, until February 1, 2019. By February 4, 2019, four (4) members will be selected in a lucky draw to win either a hoodie or a t-shirt. * To qualify, a member must contribute a minimum of 3 messages per day. * Being muted for violating the group’s rules will reset your current points to 0. * Anyone who is actively spamming will be immediately disqualified. * User input will be reviewed during the lucky draw. If a member selected in the draw is assessed to have sent spam messages and other low-quality content (single letters/words unrelated to the ongoing discussion, as well as random GIFs, links, stickers, and other media), then that member is disqualified, and another draw ensues. * Please comply with all the rules and regulations of the Binance English Telegram group. * Rewards will be distributed within twenty-five (25)25 working days after the raffle. BONUS PROMO: Retweet the post on Binance’s Twitter account about this promo and get a chance to win one (1) hoodie during the lucky draw!